A special Wedding Cake that will be the ideal toast for wedding ceremony. 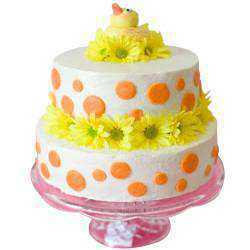 Send this astounding Two-Tier Wedding Cake with nice yellow floral decorations for any wedding or other grand occasion. This cake weighs 5 Lbs and is freshly baked. To ensure the freshness of the cake this cake is delivered in hand. Witness the heart of your dear ones smile when you gift them this Premium Mixed Flowers Bouquet with 5.5 Lbs Two Tier Wedding Cake and make them feel at the top-of-the world.